If you read a lot of old SF mags like I do, you will surely come across names you aren’t familiar with. A quick look on ISFDB usually tells me which major writers or associate editors wrote the story under a pseudonym. Some that did a lot of this were Paul W Fairman, Milton Lesser, David Wright O’Brien, Randall Garrett, and Henry Kuttner. I mean somebody had to write all those Will Garth, CH Thames, Alexander Blade, and Ivor Jorgenson stories, right? But occasionally, just once in a while, you come across a name that wasn’t a pseudonym and you wonder: who was this wordsmith who wrote a half dozen stories, then gave up the game? Such a writer for me is James Rosenquest. Never heard of him, right? Nor are you ever likely to. Unlike Cordwainer Smith, who is a pseudonymous author who began in the low-to-no-pay magazines, James Rosenquest is no genius waiting to be discovered. In fact, most of his stories appeared in Super-Science Fiction, one of the worst SF publications of the 1950s. 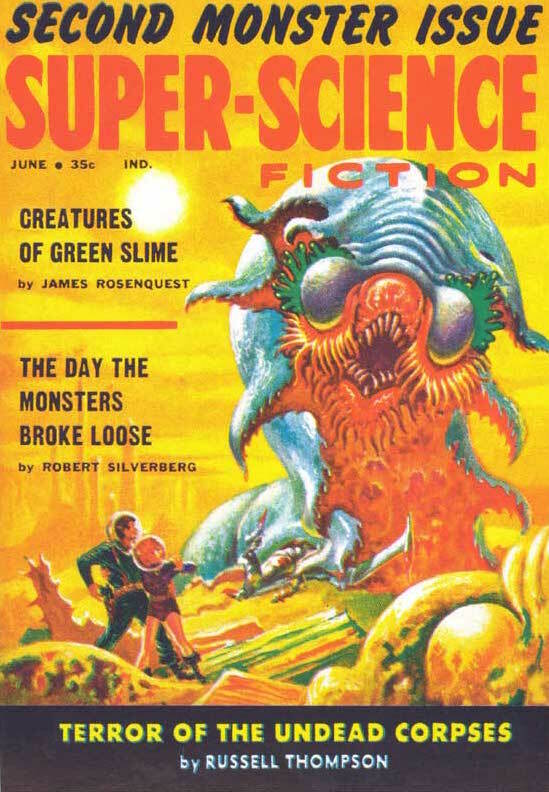 At the end of the magazine’s run, for five issues in a row, James Rosenquest provided a story in a magazine filled with writers who would become famous in the decade ahead: Robert Silverberg, Harlan Ellison, and Jack Vance, as well as a few old pros like Isaac Asimov and Robert Bloch. The magazine was filled with hastily composed stories written on auto-pilot (Silverberg was pumping out 10,000 words a day) or unsellable clunkers from the reject pile. But neither necessarily applies to Rosenquest, as he was not a regular contributor elsewhere. One possibility was that Rosenquest was WW Scott, the editor of the magazine. Quite often, when an editor can’t find enough material, he will write some himself, usually under a pseudonym. Harry Bates did it as Anthony Gilmore. Ray Palmer was Edgar Rice Burroughs knock-off JW Pelkie. Howard Browne was no less than twelve different pseudonyms. The same company did not own the three magazines that Rosenquest appeared in. 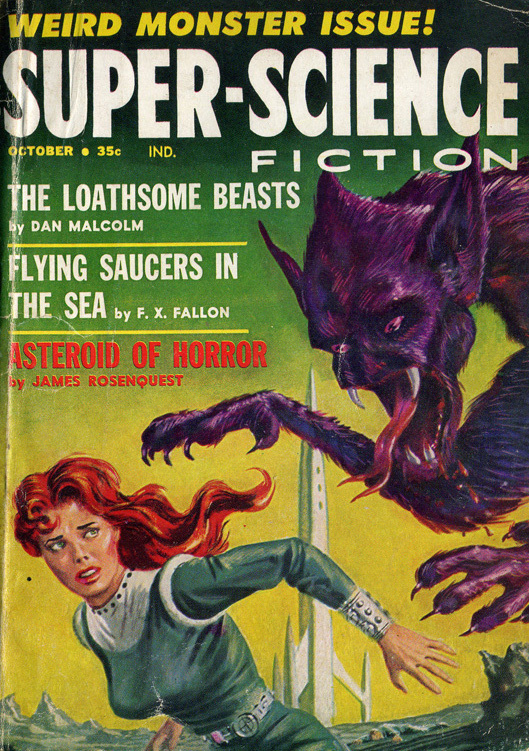 Super-Science Fiction was published by Headline, Shock Mystery Tales by Pontiac, and Fantastic Universe by Leo Marguiles. Scott worked on Man-To-Man for Official Com Inc. in 1950, before heading to Headline where he edited Trapped (1956-60) and Guilty along with Super-Science Fiction. Since the Super-Science Fiction stories appear first, Scott may have written them at the magazine’s end, then kept the pseudonym when he wrote stories for the other two. What makes this unlikely is that Scott has no writing credits under his own name like most SF editors did, and he stayed on with Headline for at least two more years. Why sell to the competition? Why write SF at all, since the majority of his work was in men’s and mystery magazines? It is unlikely James Rosenquest was WW Scott. Whether James Rosenquest was WW Scott, a pseudonymous writer, or J. Wesley Rosenquest, we may never know. What we do know is it that James Rosenquest wrote seven tales that stand or fall on their own merits. I personally found them worth a read, though no tears at the thought of him hanging up his quill pen in 1962.